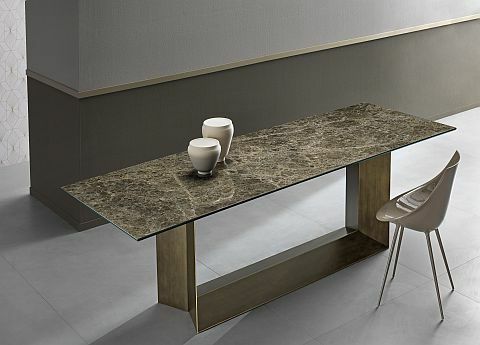 Bonaldo’s new Panorama collection, designed by Fabrice Berrux, is a great example. The modular design has a wealth of beautiful fabrics to choose from and the covers are all fully removable. 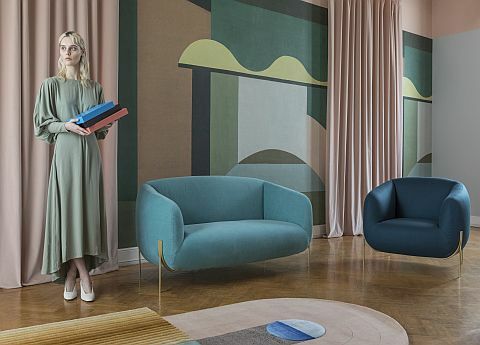 You can also mix and match different fabrics and colours, as Bonaldo boldly demonstrates here, and the sofa pleasingly comes in three different sizes. The armchair is also cleverly designed to slot together with the sofa and pouf to create a larger seating area. 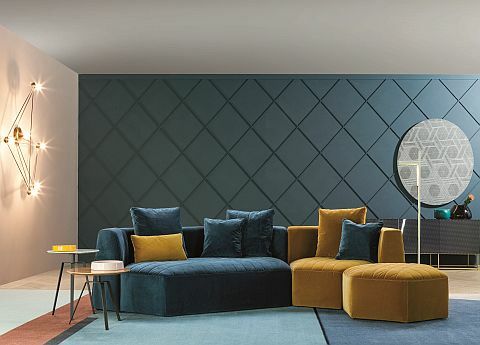 Saba Italia’s new Geo Collection has also wowed us lately with the vast range of luxe fabrics on offer, including plush velvets (a trend that is definitely hanging around for 2019). Both Saba and Bonaldo have also embraced a move towards more organic shapes. The Geo, designed by Paolo Grasselli, has deep proportions, gently curved arms and backrests, and is designed to ‘hug’ the body. And lets face it who doesn’t love a hug. And in answer to the question, “are metallics STILL with us?”. Yep. Note the copper and satin brass finishes offered with the leg design of the Geo. We’re still in love with metals – and the Geo range shows us why. It’s simply one of the best ways of injecting glamour and sophistication into a design. 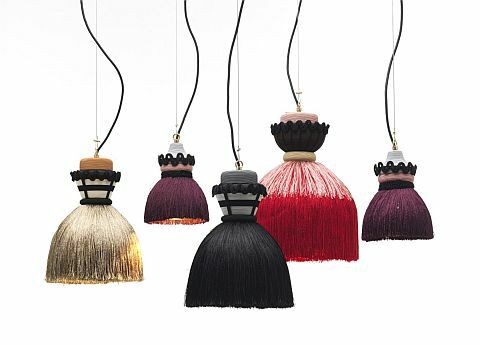 Always ahead of the curve, innovative Como based design-house Mogg produced an earlier collection of lights that tap into another of 2019’s hotly tipped trends: fringes and tassels. The Madama pendant light collection was designed by the incredible Cristina Celestino (confession: ‘girl crush’ – we have Celestino’s amazing glass dressing table, Opalina, in our Kings Road showroom at the moment and it is THE most beautiful piece of design – if you haven’t seen it, please, please pop in to drool over it with us). The design of the Madama lamps was apparently inspired by the stiff petticoats used in the nineteenth century to make dresses and skirts more voluminous. They’re fun, sumptuous, colourful and fascinating, adorned with luxurious fringes and ribbons. We’re not sure that we’d welcome back the ‘voluminous look’ to the fashion catwalk but these lights are definitely a winner. Mogg also got the trend for botanicals far earlier than anyone else and that trend is destined to keep on blooming. We’ve always loved pot plants in our houses but boy haven’t they taken off in the last couple of years. And for those of us who can kill anything green by just looking at it, it’s officially no longer naff to have artificial or faux house plants. In fact faux plants have become a trend in their own right, helped by the amazing number of real-looking fake plants on the market now, from palms to succulents to entire trees. Look out for botanical wallpapers, botanical fabrics… just anything botanical. Mogg’s Amazzonio lights, as pendants or brand new for this year, a floor lamp, are by designer Marcantonio Raimondi Malerba for this great little company. They were showcased in Milan earlier in the year where they picked up countless fans, us amongst them. 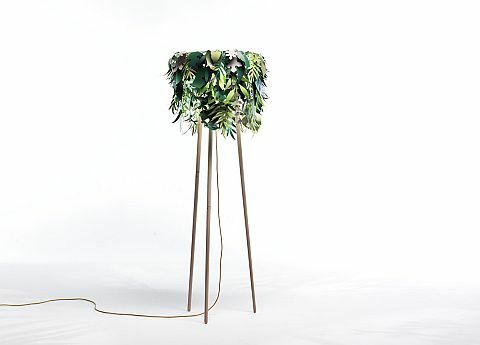 The evergreen design is created by layering variously sized plastified ‘leaves’ and, as the name suggests, the look is meant to conjure up the Amazon rain forest. When it comes to entertaining, ‘staying in’, we’re told, ‘is the new going out’. Lots of designers are now producing cool accessories for mixing your own cocktails or decanting drinks into smart looking carafes. Is this another 70’s revival along with vinyl records and record players, raided from dusty lofts, or simply nostalgic purchases? Or do we all secretly just love hunkering down with a good box set and a tipple? Entertaining at home is always fun, and providing guests with an array of fancy drinks even more fun. 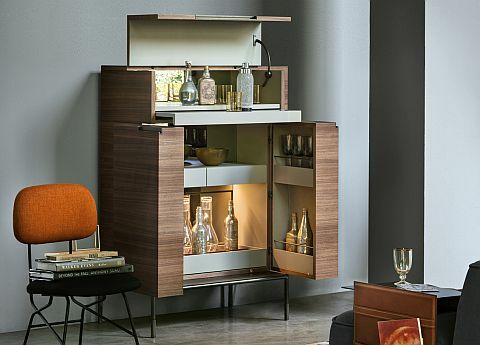 The Lema Winston Drinks Cabinet/Bar is a true box of wonders. The interior of the cabinet is incredibly well equipped with drawers, bottle holders, removable compartments and subtle lighting. Designed by Christophe Pillet, the Winston has echoes of traditional Chinese cabinets. It’s a very stylish piece of furniture that offers up no clues as to what the interior might hold. Pillet used beautiful solid Canaletto walnut for the exterior frame and the interior is lacquered in ombra with leather inserts, while the base is made from bronzed metal. So, forget the drinks; this is surely a piece of design that you should invite friends round to simply ogle at – then you can step in with your ‘shaken but not stirred’ routine. For everyone who has loved the industrial look that’s been around awhile, you’re also in luck. It’s here to stay. Luxury brand Vibieffe’s new Ribbon table is a striking piece of design that will fit any industrial vibe you’re trying to create. 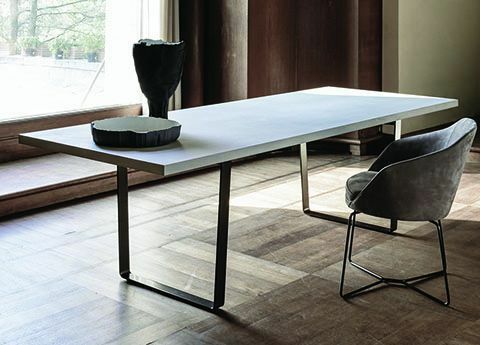 Designed by Gianluigi Landoni, the table frame is in solid steel and the legs have a burnished finish. The table top adds to the over all industrial feel with a concrete-effect material, that not only looks superb but is also totally stain-proof. It comes in two sizes, either 210 cm or 250cm wide. Tonelli Design have also recently produced a stunning industrial feel dining table in the form of the T5 (which we mentioned in our ‘family friendly dining tables piece last month). Designer Giulio Mancini tops his new design with a beautiful marble-look ceramic glass and then given it a seriously impressive lacquered, solid metal central base, which can be chosen in graphite black, matt or white brushed bronze. So, if you’re looking for ‘industrial meets luxury’ this table will certainly do it for you.